The annual exhibit of artists books made by members of the Book Arts Roundtable is now open at the Pierro Gallery in South Orange. It runs until April 22. Two of my handmade books are on exhibit. Below are some photos and a poster for the show. My first book below is about my paternal grandfather, Antonio, who came to the US from Sala Consilina, Italy in 1880. I never met him but I have so many questions for him that I put them together in this accordion book along with photos and documents. The next book is made with just two pieces of paper using an interlocking double accordion structure-no sewing or gluing. Here is the pertinent information about the show. Please join us! Our next adventure was a tour of the Vasari Corridor. I’ve always wanted to visit the corridor which begins at the Palazzo Vecchio, winds through the Uffizzi Gallery, along the Ponte Vecchio and ends at the Palazzo Pitti across the Arno River. The passageway was the idea of Grand Duke Cosimo I de’ Medici in 1564 and was motivated by the Grand Duke’s desire to move freely between his residence and the government palace without interacting with the people. He commissioned Giorgio Vasari, the Italian painter, historian and architect, to create a design. On the guided tour, we were told the corridor’s history and were cautioned by a Uffizi Gallery guard not to take any photos in or of the corridor. She accompanied us every step of the way and only allowed photos taken out the windows. Along the winding corridor, we saw an extensive collection of self-portrait paintings. The Grand Duke appropriated private property for his corridor and built across the facade of the Church of Santa Felicita. A corridor window looks into the church and the Duke and his family could attend mass and not be seen by the public. Sorry, no photos through this particular window. It was fascinating to see familiar locations from a completely different vantage point. What hidden treasures have you discovered in Florence? I’ve visited Florence numerous times and I wondered if I would tire of it and take the first train to, well….somewhere. But no, there are always new things to do and familiar places to see again. During my visit to Florence this summer, the first tour was to see the newly restored frescoes which depict The Legend of the True Cross on the walls and ceiling of the High Altar of the Church of Santa Croce. Scaffolding was in place while the finishing touches were made to the frescoes and this allowed visitors to tour the art. Without a special request or additional cost, an English speaking tour guide was there to translate just for us. Grazie! We climbed the 110 scaffolding steps to the top. It was so exciting to literally be face-to-face with the life size figures in these incredible frescoes painted by Agnolo Gaddi – son of Taddeo Gaddi. Italian restoration only allows the frescoes to be cleaned. If paint or gold leaf is missing, it remains in that condition. Because of this, we saw some of the lines of the original drawing on the wall. Amazing! No photos were allowed in this area, so we took out our journals and drew. To see even more photos of Florence, be sure to preview my book at blurb.com. 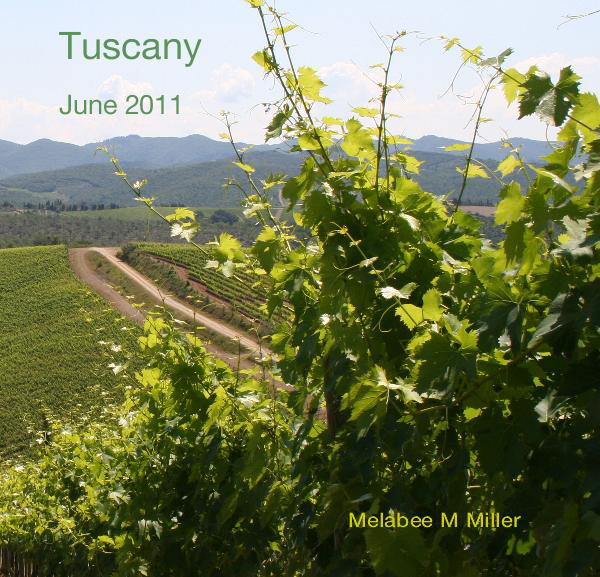 I am proud to announce my photo essay, Tuscany June 2011. The book chronicles my latest adventures in Italy. You’ve seen some of the photos in previous posts, like this one about Siena, but there are lots more to see. The book is thirty-six pages filled with photos and available for purchase at Blurb.com. I am thrilled to share this with you and hope you enjoy the book. Our next excursion was to Siena, a very large city in comparison to my favorite town, Radda in Chianti. Siena is well known for the Palio, a spectacular horse race that takes place in the center of the city twice a year. But we were looking for a different Siena and found some unexpected things. We were dropped off at San Domenico Basilica where, much to our surprise, we came upon the head and finger of St. Catherine of Siena ( 1347-1380 ). No photos permitted in the church but, if you’d like, you can see her head here. Next, we walked on Via Cittá and heard classical music. Following the sound, we entered the courtyard of the Palazzo Chigi Saracini (This link shows a 180° view-don’t forget to look up.) which houses the Chigiana Musical Academy. We sat on a bench and lost track of time while we listened to music, worked in our journal, photographed and watched people. The most wonderful site was the crypt (cripta in Italian) which was re-discovered in 1999 under the Duomo (Cathedral). I was disappointed because photography was not permitted in this space which was full of incredible frescoes and decorative patterns. But I had an alternative to photography-my journal. I made drawings of the areas I wanted to remember. A whole new world has opened to me. Now along with my camera, I travel with a notebook and pencil.